Mirror Included - Single Sink Vanities What kind of features do you look for in a single vanity? There are many features to choose from including off center sinks and open shelves. With the plethora of different vanity styles, you have the convenience of changing up your style a little including Mirror Included. 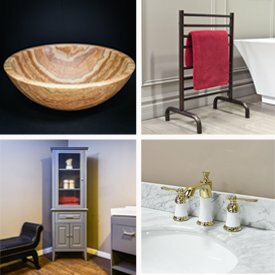 Each feature adds a bit of subtle and unique flavor to your bathroom experience. For Mirror Included vanities, Luxury Living Direct has a large range of styles, finishes and configurations to meet your needs. If you are looking for 2 or more vanities, give us a call at (800) 574-3022 and we’ll quote you out a special price!